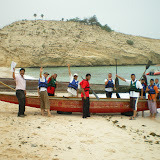 This blog is supporting the Startup of the Oman Dragon Boat Club in Oman. OmanDBC is turning a page - Bye Bye Francois ! - Search Result on "Dragon Boat Safety"
As the "Dragon Boat Agitator for Oman" in the last 2 years, Francois and his family are leaving Oman Q1 2009; moving to the Southern hemisphere. Francois owned the 912 boat and equipment used in 2008 and which might leave Oman if nobody takes over. The Boat, the mould and the trailer + accessories are up for bulk sale at 2800 OMR until March 2009. Thanking by the way everyone who came to support him, now whoever wants to pick up the Dragon Boat activity in Oman can raise his voice and contact him using the details below. - 2 dragon boats are now parked in PDO club allowing 22 paddlers and one drummer to demonstrate Dragon boats for the first time in Oman. - Those Dragon Boats will only remain few days in Oman. The Meeting point for training is behind the Shangri-La on the Shangri-La Marina bay (North East of the ODC bay) side and get a formal dragon boat training from the President of the IDBF himself. Considering we can work together efficiently to learn how to use the boats we can expect to have gentle/fair 200m races within a couple of hours. NB : It is essential that all people getting on understand in this occasion they need to know how to swim for safety reasons but they do not need to have any previous experience using a paddle to be able to participate. (*) non-swimmers are welcome to encourage paddlers from the pontoons and enjoy the buffet. + A safety boat and life jackets will be available, however there is no plan to get you in the water for swimming nevertheless the eventuality needs to be considered. Do you want to put some more time to understand and support the potential of Dragon boats in Oman ? - Presently those games have 10 disciplines of which one of them is Dragon Boating a sport which has not yet been introduced into Oman. 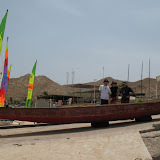 - I have been working for some time on trying to get Dragon Boats in Oman for a UWD event. This last Weekend I have just rented two of those boats but we have them only for one short week. - Depending on how much effort and time everyone of us would like to put in all members of PDO recreation centre could become within few days from initial training a certified crew- or helm but also a certified coach trainer. - The IDBF president called Mike Haslam has accepted to fly from the UK for one week on a sponsored flying ticket granted on UWD event budget. - In the following days Mike Halsam will also give a course free of charge to anyone who would like to become an event organiser that the Ministry of Sports started looking for since Oman was elected to become host of the 2010 Asian Beach Games. - This way all Omani citizens certified by the IDBF can become Dragon Boat Ambassadors at the Oman Ministry of Sport. I expect that by next Saturday all the training and demonstrations will have been safely and satisfactorily concluded allowing a group of them to meet an official representative of the Minister of Sport in Oman whilst Mike Haslam is still in Oman. - Monday evening The IDBF President arrives in Muscat. - Friday - Boat are supposed to go back to Dubai / Mike Haslam Offered to give the Organizer formal course and review IDBF certification for crew / coaches seen in action the days before. - Saturday - Mike Haslam president of the IDBF hope to meet with the Omani Dragon Boat Ambassadors a representative of the Minister of Sports in Oman – To be confirmed. - Thanks for Jan Willem Brinkhoerst president PDO recreation centre and Todd Perkins (also) treasurer of PDO recreation centre. - Special thanks to UWD Director Eamon Gorman who sponsored this first Dragon Boat event. (*) For non-swimmers I hope to offer them in other times access when next time Dragon Boats will come to Oman and with enhanced plan against risk of drowning. I personnaly consider that a safe approach to Dragon boat goes side by side with fun because without it, the greatest day is threatened to turn into drama. Dragon Boat safety should be taken seriously because no-one wants to turn a fun event supposed to advertise a corporate team spirit into desastrous bad reputation that would spread faster then any good news. With this post I am calling on factual safety concerns any paddler or witness could recall and share just replying to this post. I would appreciate if a minimum fomat was followed to allow comparing events amongst themselves. I am looking forward to read each other`s feedback, eventually send me on email any incident near misses or safe recommendations which could help our bragon boat community grow with fun and maintain excellent reputation. I want essentially to thank all Oman paddlers who had responded positively to my ealier invitation, unfortunately, the DB event in Dubai on December 2nd 2006 had been cancelled. In short if Oman DBC want to join Dubai event we need to get enough paddlers and sufficient funds. Hence,some of you might have noticed OmanDBC banners, cups, stickers, tshirt are now available to grow Dragon Boat in Oman raising funds for the cause. I hope to get new DB event to offer soon thanks to sponsors starting to get interested to support OmanDBC. The Status of OmanDBC is not yet decided between the choice of starting outside or inside PDO Ras Al Hamra club (Petroleum Development Oman). The OmanDBC status with or without PDO RAH will depend on legal terms regarding finance, type of members and the ability to deal with the equipment received from the IDBF and OmanDBC owned equipment. The main subject at the moment is to find out how many paddlers can commit to support sponsors motivation and organize IDBF free boats shipping to Oman. - Historically OmanDBC started during a conversation around a table about Team building exercises available in Oman and recalling 1999 corporate Dragon boat shared experience in Europe. - On Saturday, April 10, 2004 Trials had been made to attempt using local (Quryiat-Sur) Oman boat construction and design thanks to Abdullah Al-Shamakhi who also introduced me to the Oman's North Coast 80's single seat-er paddling boat champion (The over 70’s year old person who, I hope, will accept my apologize because his name was lost in translation). - After 2 year old email relation with David Martin (President "Dragon Boats Alive" (UAE) Mob +971 5581 489) on Wednesday, August 30, 2006 he announced me Dubai was ready to rent boats out to Oman. - Almost at the same time Wednesday, September 13, 2006, Mike Haslam representing the IDBF offered two boats to develop Oman's club as soon as it will be registered with the IDBF. Ref email "...The IDBF has a number of boats from different manufacturers to help develop the sport in new areas. The IDBF in sports political terms wants to have 75 Members before the 2008 Beijing Olympic Games. This is the number of Members that we need before we can apply for acceptance as an Olympic International Federation..."
- Saturday, September 16, 2006 OmanDBC was declared to the IDBF represented by Francois Dorleans (IDBF member, author of this long text, and only person supported by a few good friends to bring dragon Boats to Oman ...). - Since that time OmanDBC is trying to the main action on going (apart from managing emails) is to promote the OmanDBC in order to get 20k USD to start getting boats for training and initiate first events locally around Muscat.  Advertising OmanDBC started from personal friends drawing (thanks to Paul Shiel who should be remembered for the OmanDBC + (minimum) personal funding. The idea to invest in marketing materials should lead to get as many Oman potential members feedback to email their support or comments using the following link OmanDBC@gmail.com.  A first quotation was received from equipment supplier Andy ESSENCE www.dragonessence.org . It was not clear on that quotation the boats should come free of charge thanks to the IDBF offer and details update on the quotation to present to the sponsor. In short you should see more of the OmanDBC broadcasted in Muscat and even more when boats will be available in the country.